There was a sizable “bacon boom” a few years ago, a spell where the country fell head over heels for those sizzling strips. But long before it got its own cookbooks, bacon was a reliable staple of breakfast, lunch, and dinner, so much so that it regularly wiggled its way into our TVs and earbuds. Because we love bacon however we can get it, we’ve compiled a few of our favorite clips below. Ron Swanson is a simple man. As played by Nick Offerman, Swanson is the unmovable object of Parks And Recreation’s ensemble, a man whose vice-like grasp of his convictions exudes a certain kind of comfort. And, as we’ve seen countless times on the series, many of those convictions concern meat and meat-related products. 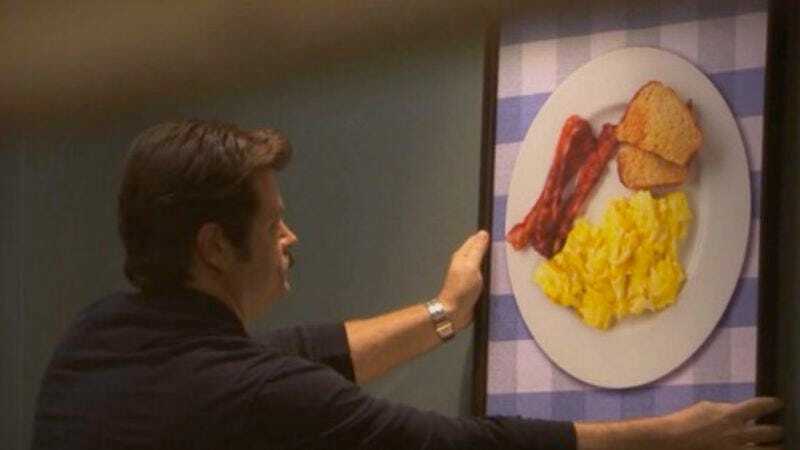 Disappointed first by the steak he receives in the diner in the above clip, Swanson firmly informs the hapless employee that he’d like “all of the bacon and eggs that you have.” This being a man who favors simplicity and clarity above all things, however, he stops the waiter to inform him that he is to be taken literally. For Swanson, the only alternative to a poor steak is a diner’s full supply of bacon. And you know he’s gonna eat it all. Burgess Meredith’s wily and frisky Grandpa Gustafson is the best part of 1993’s Grumpy Old Men and its follow-up, 1995’s aptly titled Grumpier Old Men. In the latter, we discover that the key to Gramps’ longevity is his diet, which, according to him, consists of nothing but bacon. Five strips for breakfast, a bacon sandwich for lunch, and, for a midday snack, “a whole damn plate!” That might not be a diet for everyone, but it worked for him. “I should’ve took a dirt nap 30 years ago!” he says. “Sometimes I worry that God forgot about me.” Nah, it’s the bacon. Jonas drew inspiration from that legendary maxim: “Everything’s better with bacon.” He tells Capital FM, “The idea is when you are out of a relationship and you start to be okay with the fact that it’s ended. In my case my life was great, it’s so good that we should throw some bacon on it to make it even better.” Bacon’s no simple metaphor in the video, however, which finds Jonas in a greasy spoon, heaping strip upon strip onto plates from a sizzling griddle. This sketch from the final season of MTV’s The State is an odd one. In it, Robert Ben Garant, adopting the dopey guise of bygone TV spokesman, extols the many virtues of bacon, which include using it to make dresses, as a prom corsage, or even as a confidant (“I’m feeling mopey today, bacon”). It’s classic State, however, in that it eschews a clear punchline by burying the joke so deep into the fabric of the sketch itself. 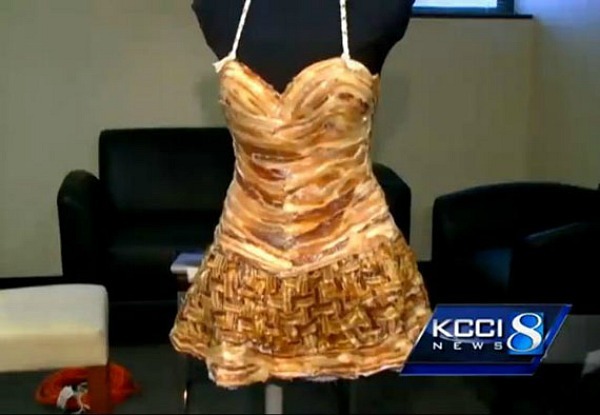 Turns out that bacon dress wasn’t so absurd, after all. It was the last straw. “She’s acting like she’s the queen and we’re the sorry people!” he declared before packing up his tiny suitcase and storming out of the house. His tirade might’ve been obnoxious to some, but it inspired others. A number of dance and dubstep remixes surfaced in the aftermath, but this one’s our favorite.